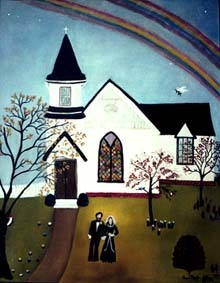 Ann Murfee, a member of the congregation, gave this charming painting to the church in 1980. She described her painting: "Historic Bon Air Christian Church was the scene of my daughter's wedding on a cold, sleety January day. In the church, wall candles burned brightly and the spirits of these two young people were united in love. Outside, a double rainbow shown in the heavens which was unusual on such a cold winter's day. We welcome you and wish you much happiness as you plan your wedding ceremony and the beginning of your life together as a married couple. A marriage ceremony at Bon Air Christian Church is a service of Christian worship in which prayers are offered, vows are made and blessings given. It is a reverent service, a covenant between a couple and God to live a life of faithfulness, truthfulness, and love. Nothing that is planned should detract from a worshipful, joyful and reverent service. The sanctuary is in demand for Christian wedding ceremonies by members of our congregation as well as for many couples outside the congregation. Over the years many of those couples have become members at Bon Air Christian Church. We encourage you to visit with us and experience our worship services on Saturday evening or Sunday morning. Couples often choose our sanctuary for its quaint, Victorian beauty and its size which creates an intimate atmosphere for the ceremony. Seating capacity is approximately 135 in the congregation. Occasionally family members as parents and grandparents of the couple use the choir loft for seating. When planning your wedding and the number of people in your wedding party, consider the space available in the sanctuary for attendants to stand and for your guest to be able to see your service. All furniture, pews, piano, tables etc should remain where they are placed and not be moved or removed from the sanctuary. Bon Air Christian Church is most often chosen for weddings because of its sacred beauty. The sanctuary requires very little decoration. A minimum number of flowers should be considered. Flower arrangements are often placed on the altar or piano. Bows can be hung from the 12 sconces around the sanctuary using pipe cleaners, ribbon or wire that has been wrapped with cloth. No tacks, pins, tape, glue, nails, wire can be used to attach decorations. There are 12 sconces around the interior of the sanctuary and candles in the sconces may be lit during the ceremony. Table model unity candles may be used on the Communion Table. Freestanding candelabrums are not permitted. Since the wedding is a service of worship, its music should be appropriate for a church service. The organist will be happy to advise the bride and groom as to what music might be used. The church organist should be contacted for weddings in the church but other organists are permitted to play. Because of the sacredness and beauty of the wedding service, photographs should not be taken during the ceremony. Photographs are usually taken following the wedding. The rehearsal should not take longer than one hour. Any wedding involving more than four persons in the ceremony should probably be rehearsed. The minister is in charge of the rehearsal. Wedding coordinators may assist as requested by the minister. The bridal dressing room for the bride and her party is located in the library behind the office. This area can be closed off from the rest of the building and has an adjacent bathroom. The groom's party can meet in the parlor adjacent to the secretary’s office and use the restrooms in the hallway behind the sanctuary. The custodian will open the church one and one half (1 ½) hours before the wedding ceremony is scheduled to begin and a few minutes before the rehearsal. If additional time is needed, you may pay the custodial to come in earlier if she is available. Please share this information with your florist and photographer. The custodian will be present in the building throughout the wedding and/or reception. The use of rice, confetti, sparklers, and handheld candles is prohibited. Birdseed is allowed outside of the building; however this is usually done following the reception rather than the wedding ceremony. Do not move church furniture including pews, piano, and tables. Do not use tacks, pins, tape, glue or nails on walls or furniture. Alcoholic beverages are not permitted anywhere on church property. Parking is available in front of the church as well as in the parking area behind the church which is entered from Logan Street. Please do not leave cars parked in the church parking lots on Saturday night. Security Deposit $100 This will be refunded if everything is left in good order. Organist $200.00 Additional fees may be added if the organist accompanies soloists or has additional solo songs to perform. Fellowship Hall $400.00 If additional time is needed there is a charge of $75.00 per hour. Fellowship Hall Security Deposit $100.00 This will be refunded if everything is left in good order and there is no damage to the premises. If any changes in dates or time become necessary please contact the church office prior to making any changes. The Reverend Cynthia K. Stratton has served as pastor of Bon Air Christian since 1986. She gives first priority to members of the church in scheduling weddings, but she will officiate weddings for non-members as her schedule permits. If you would like Reverend Stratton to officiate please call the church office and schedule a meeting. Reverend Stratton requires premarital conferences with the couple prior to performing a wedding ceremony. These premarital conferences as well as rehearsal and wedding date schedule should be discussed with her and scheduled prior to making other arrangements for your wedding. If Reverend Stratton is officiating, bring your marriage license to the church one week prior to the wedding to be completed by the secretary. The Virginia marriage license is valid for 60 days after application. Other ministers are invited guest to officiate weddings at the church. Please note that in order for the marriage to be legal the minister officiating the wedding ceremony must be ordained and must be registered with a Circuit Court in Virginia. The Bon Air Land and Improvement Company built the Gothic Carpenter Church in 1882 for the guests of the Bon Air resort. It was called the Bon Air Union Chapel and is one of only two of the public buildings of the resort era standing today. In 1884 the land company offered the building to any congregation that would maintain it. Bon Air Presbyterian Church was organized and occupied the building for almost eighty years. In 1963 the Bon Air Christian Church, Disciples of Christ, was organized, purchased and moved into the building and Bon Air Christian Church has occupied the building since that time. The building has gone through several major renovations starting in 1992 with the addition of a new fellowship hall, kitchen, meeting rooms and baptistery and in 2007 with the dedication of a new Sunday School addition all to allow for a growing and thriving congregation. The church has made the building available as a meeting place for many organizations such as the Bon Air Woman's Club, Garden Clubs, Boy Scouts, Girl Scouts, the Bon Air Historical Society, Daughters of the American Revolution, and AA. For many years it has been the center of activities on Victorian Day following the Victorian Day Parade sponsored by the Bon Air Historical Society. It also houses Caritas and is the hub for many outreach activities sponsored by the congregation. For more information please contact us during office hours Monday through Friday, 9:00 AM - Noon.